Product code: W429 Categories: Sold Items, Sold Rolex Watches. A ladies watch from the 1960’s is lovely, a ladies Rolex watch from this era is wonderful and a diamond set ladies watch from this decade such as this one is simply breathtaking. Made in 18ct white gold in 1969, this ladies Rolex is set with a total of 108 diamonds resulting in a Rolex watch that sparkles beautifully. Set with a combination of single cut diamonds, round brilliant cut diamonds and tapering baguette cut diamonds, the diamonds total a dazzling 2.16 carats that is sure to be admired day or night. 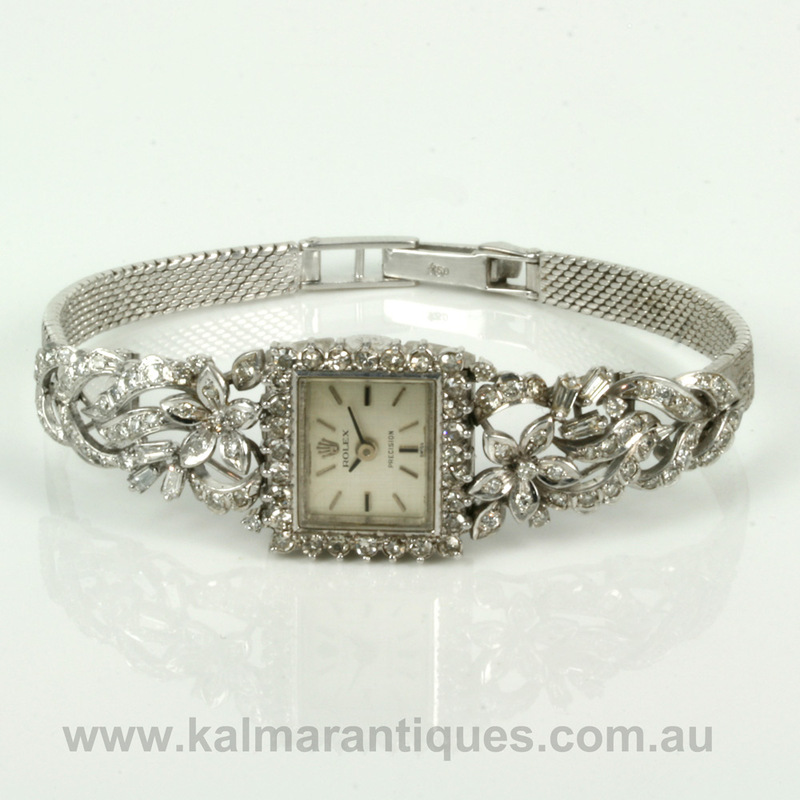 The dial is so elegant and with the border of diamonds measures 18.5mm across. Laid out from end to end the watch measures 17cm in length and is very comfortable to wear all the time. Inside there is a 17 jewelled manual wind Rolex calibre 1800 that has just come back from a full service and restoration and runs perfectly and comes with our 12 month warranty. There is no doubt that this is one of the most incredible ladies Rolex around and one that is sure to impress.